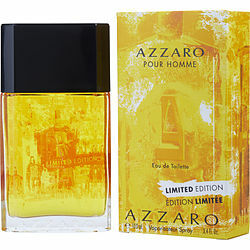 Opt for a timeless scent as your next fragrance staple with Azzaro Pour Homme Summer. This rich fragrance for men created in 2013 is especially designed for the refined man radiating an aura of sophistication. Top notes of Italian mandarin and lemon offer a whiff that is fruity and light while Moroccan artemisia and Egyptian cumin notes finish off the Mediterranean cocktail of this fragrance. Petitgrain notes draw out the citrus fruits and hints of leaves and twigs, leaving a lingering woody aroma ideal for the confident man.